We love hearing different ways you use MIA and it doesn’t always have to be in sweet treats. Sometimes dark chocolate can work just as well and provide real depth, luxury and warmth to savoury dishes. 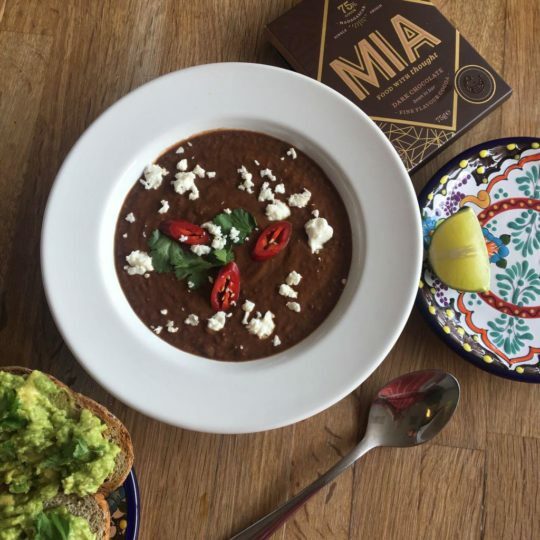 The richness of our chocolate works brilliantly in this Black Bean Mole Soup from the cookery school – Little Kitchen in Bristol. So with the cold weather hitting and soup definitely the dish of the season, get kitchen creative this December and tag #MIAfoodie when you post your cooking creations. Melt the butter in a medium saucepan over a medium high heat, add the diced onion and allow to soften and slightly caramelize. Add the garlic and spices, stirring for around a minute. Stir in the chocolate and tomato with the chipotle chilies, pour in the stock and leave to simmer for around 15-20 minutes. Blend the soup to the desired consistency, season to taste and garnish with the chopped chillies, crumbled feta and coriander. Serve with avocado toast! For a Vegan variation, swap the butter for vegetable oil, swap chicken stock with vegetable stock and top with crushed peanuts rather than feta.